Are you new to massage? Or maybe you just have some general questions you need answered. Check out some of our most frequently asked questions; if your question isn’t here, feel free to contact us via our Contact Us form. 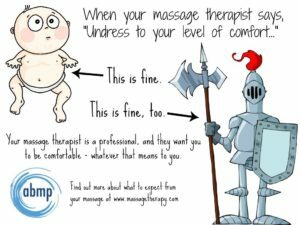 How do I dress for a massage? Or, how much do I undress for a massage? We work with clients fully clothed, or fully under a sheet. What you wear under that sheet doesn’t matter to us. You’ll always be covered. Though, if you need to wear armor, maybe leave the ax at home. We highly recommend trying out our Introductory Massage if you’re a new client or new to massage. During this session we will discuss your needs with you, determining what type of massage is best for you. We will also explain why we think that type of massage is what you need. If you’ve had massage before, and you have a specific area you need us to work on, give us a call or Contact Us to find out what type of massage is right for you. Our therapists are trained in many different modalities; based on your needs, we can figure out what type of session would be right in your case. Do you accept insurance for massage? At this time we don’t accept insurance for massage. However, we can print you a super bill, which you can submit to your insurance company to see if they will cover your sessions. Swedish massage is generally lighter in nature, with strokes that always move toward the heart. The idea behind this type of massage is to improve your blood and lymph circulation and promote relaxation. Deep tissue massage encompasses more than one massage modality, or type. In general, deep tissue focuses on deeper muscle layers, tendons, ligaments and fascia. Deep tissue work is also fundamental for breaking up adhesions or “knots” in muscles. What’s the difference between Swedish massage and deep tissue massage? Do you do pregnancy or prenatal massage? Yes! You can come visit us for a massage during all stages of your pregnancy. We even have special bolsters for our pregnant clients!